"Slack" is an old place name that had nothing to do with looseness, it merely signifies a "hollow," a flattish place. 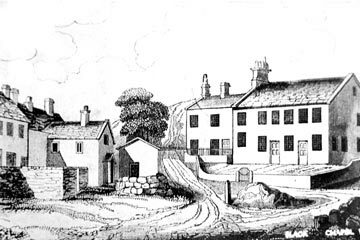 In the year 1836 a Mr Crabtree walked this way and observed "a straggling hamlet called Heptonstall Slack where, it is said, there are the remains of some earthworks but of what nature I have been unable to ascertain." A not unfamiliar experience even today. In size and shape Slack Chapel is typical of the many Baptist churches which flourished in the Pennines. 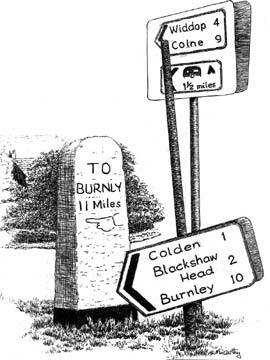 The old milestone showing that "Burnly" was a mile further on than today! One of the early ministers, the Rev Richard Ingham, had a strong aversion to performing the marriage ceremony. Not from any doctrinal conflict but simply because he did not like to make people unhappy. He never conducted a marriage service. From "Heptonstall - A walk around the Edges" by Stan McCarthy.